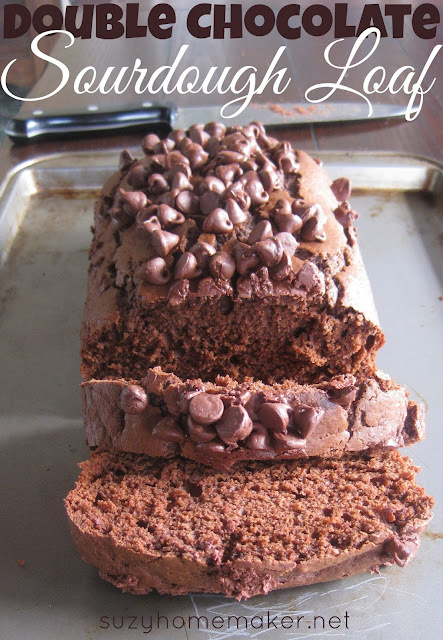 This double chocolate sourdough loaf is a great way to use up sourdough starter instead of tossing it. When making a starter, you will discard some of it as you feed it. But instead of just throwing it down the sink, you can use it for other recipes. Grease 9 x 5-inch loaf pan. Sift together flour, cocoa, salt, baking powder and baking soda in bowl. In a large bowl with a mixer on medium speed, mix butter and sugar until creamy. Add ~1/3 flour mixture then alternate with ~1/3 sourdough starter. Repeat until both have been used up. Bake for another 20-25 minutes** or until wooden pick inserted in center comes out clean. Let cool before serving if you can wait! **My oven tends to run hot. You may need to add some time to your baking. Also the chocolate chips will sink to the bottom if you add them immediately.